The third-generation mobile radio standards use broadband transmission methods to allow the configuration of communication networks with high data rates. The third-generation mobile radio standards use broadband transmission methods to allow the configuration of communication networks with high data rates. WCDMA with its bandwidth of 3.84 MHz and the underlying CDMA method places particularly stringent requirements on the total transmission chain. The signal statistics of a WCDMA signal reveal high crest factors (peak-to-average power ratios). Therefore, amplifiers with a wide linear range are required to ensure distortion-free transmission not only of average transmit power but also of high power peaks. The requirements on base station power amplifiers become even more stringent since the amplifiers also transmit multicarrier signals within the 60 MHz downlink band. In addition to single-carrier power amplifiers (SCPA), multicarrier power amplifiers (MCPA) are increasingly used. Signal sources featuring wide dynamic range and high accuracy, such as the R&S®SMIQ03HD, are required for the development and production testing of the amplifiers. WCDMA specifications allow base stations only a very low adjacent- channel power (ACP). 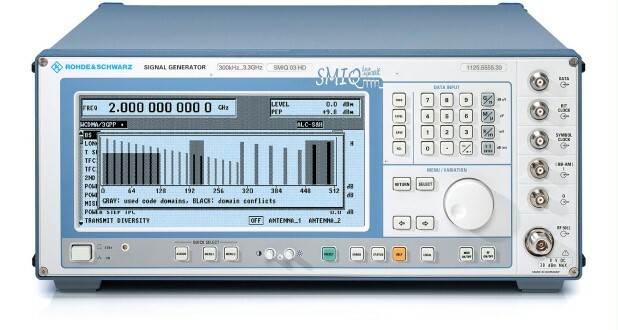 The R&S®SMIQ03HD supplies a test signal whose adjacent-channel leakage ratio (ACLR) is much better than the one required for base stations so that measurements can be carried out on amplifiers with sufficient dynamic range.